Just as I’m starting my post-grad job search, Boston University is named one of the best universities to find exceptional new hires by an American business magazine. An Inc.com article, published this week, named the top ten universities with the most ambitious students. The list includes University of California, Berkley, Harvard University, University of Oxford and BU. The study, carried out by the London-based startup ViewsOnYou, looked at data from a recruiting tool based on standard psychological measures to calculate students’ “desire for success and career advancement.” What they got was a list of the top schools — a mix of Ivy, research and public universities in America and abroad — with driven students. As a student in my final year at BU I’m not surprised the university made the list. While BU does not have as stellar a reputation as Harvard or Stanford University, it’s comprised of highly competitive and involved students. While I know these lists are usually a meaningless calculation to drive interest in the startup, it’s given fellow seniors a push to achieve as our last semester approaches. 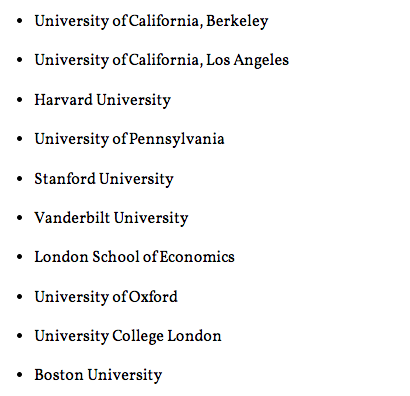 A list of the top 10 universities with the most ambitious students.